Am I What I Eat? It’s that time of year again…the time when McDonald’s rolls out their glorious Shamrock Shake! This has been a long-awaited happiness that I have every year. Some people look for a robin to indicate the first sign of spring, I look for Shamrock Shakes. This year, the happiness has turned to sadness, because the Shamrock Shake is anything but FODMAP-friendly. I don’t even know what it’s in it, but I saw “Supersize Me” and I know that whatever it is can’t be good. Despite the fact that my lactose challenge is going well, that doesn’t mean that the Shamrock Shake is appropriate. Is it made of milk? Cream? Ice cream? Ice milk? Whatever chemical McDonald’s has to make ice cream? Who knows?? 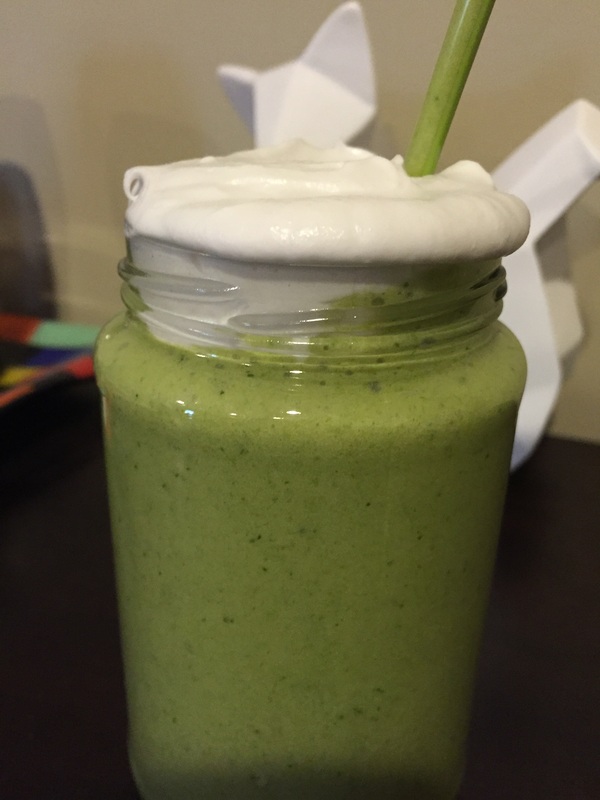 This led me to try to attempt my own, FODMAP friendly version of the Shamrock Shake, known affectionately as the “Shamrock Fake”. It comes pretty close! I alternated creating and testing this with drinking the real Shamrock Shake for comparison. I got sick later, so it’s further proof that the original isn’t made for FODMAPPERS. if using canned coconut milk:open coconut milk can and separate the liquids from solid. I used a spoon to scoop out the solid cream. Put solid cream in a container and chill in the fridge. If using boxed coconut milk, put can of coconut cream in fridge for 1 hour. 2. Add banana, vanilla, maple syrup, liquid coconut milk, mint, and spinach to blender. 3. Blend, on high for 2 minutes, then set blender to “liquefy” and blend for an additional 30 seconds. This really helps blend in the mint and spinach. 4. Using a hand mixer, stand mixer, or a whisk, whip remaining coconut milk solids until soft peaks form. 3. Put mint shake into glass, top with whipped coconut milk, and enjoy! Notes: You may need additional liquid to facilitate blending. Coconut water works well, just add small amounts at a time until it reaches the desired consistency. You can also use any liquid, dairy or non dairy. I prefer coconut milk over almond milk because it’s creamier, especially from the can. Coconut milk from the can is much fattier and will increase fat and calorie content. If this is a concern for you, use boxed coconut milk for the liquid and use canned coconut cream for the whipped cream. Enjoy the first sign of spring with your own Shamrock Fake! This would also make a great treat on St. Patrick’s Day.